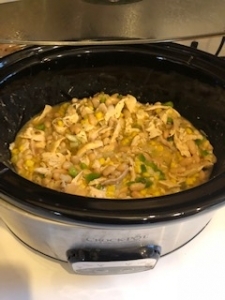 White Chicken Chili is one of my favorite things to make in the crock pot. 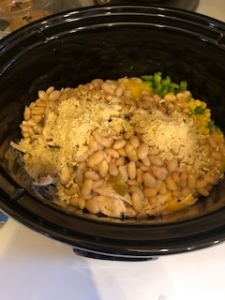 Something warm and delicious during these cold winter months! 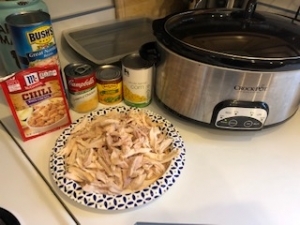 I always use a rotisserie chicken to save time! 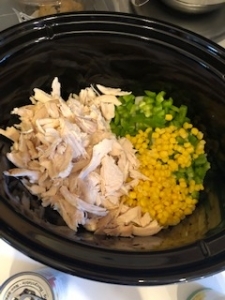 Add the chicken to your slow cooker, a cup of low sodium chicken broth, a diced onion, diced green pepper, minced garlic, can of great northern beans, green chilies, corn, and cilantro and your seasonings! 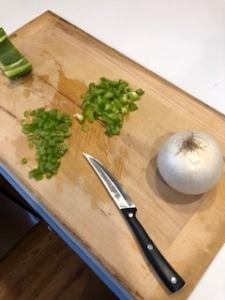 I always use a package of McCormick’s White Chili seasoning, but you can use salt, pepper, cumin, oregano, chili powder and cayenne pepper. 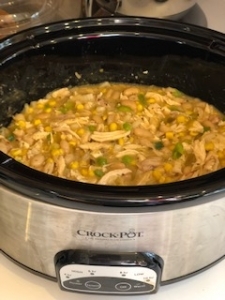 Cover and cook on low for 8 hours or high for 2-4 hours. 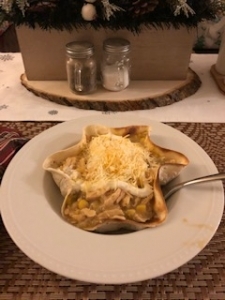 I always love to add a tortilla to the bowl before you pour the white chicken chili inside of it, then top with cheese, sour cream and even tortilla strips!